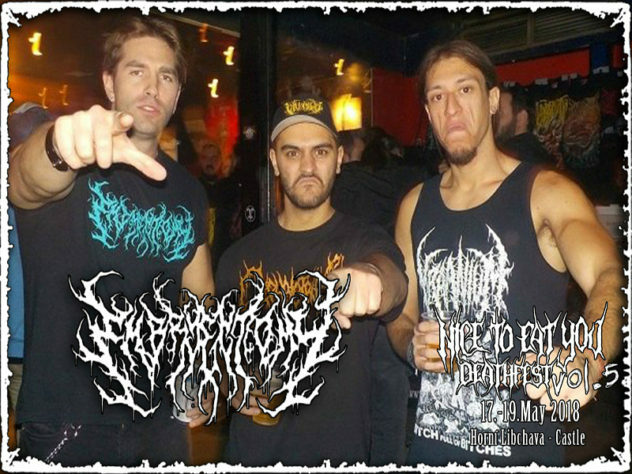 Embryectomy is a slamming brutal death metal band and one of the very few bands of its kind in Greece. They were formed in 2013 and released their debut Promo on 2014. In 2015 the split “Realm of Endless Massacre” was released along with Traumatomy and Cerebral Paralysis. In 2016, the band released their first full length album “Gluttonous Mastication of Embryonic Remnants” via Morbid Generation Records. This year, they are gonna release their second split collaboration, together with Psychosomatic Self-Mutilation and Nephrectomy via Amputated Vein Records, called “Absolution through Sacred Extrication”.